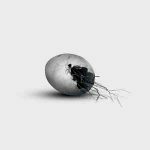 Background/Info: Martyria is a Greek male-female duo and one of the latest signings on Malignant Records. This self-titled album features 5 cuts. 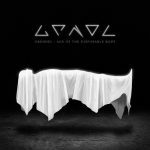 Content: This debut album has been made with ritualistic instruments, electronic treatments and mystic chants. The slow cadence mixed with authentic instruments such as a didgeridoo and wind instruments create this particular ritual atmosphere. The chants accentuate the mystery supporting this work, but the vocals have also been used as a pure experiment (on the final cut). 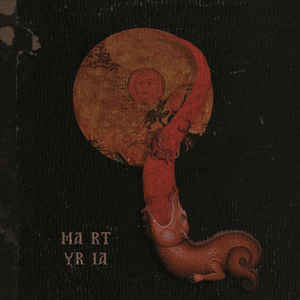 + + + : Martyria is a talented duo, which perfectly knows the way to compose ritual music. It’s not only about the use of authentic instruments, but also about other elements like the slow rhythm, the ghost-like chants and the drones, which simply empower the ritual sensation. The work has something very visual, but still transcendental. You get the impression to be surrounded by evil spirits who’re joining in for a dark rite. There are a few outstanding cuts featured on this work, which is an absolute must have for lovers of ritual music. I also have to say a word about the great 6-panel digipak of this album, once again revealing the importance of artwork. – – – : The last track also is the only one that can’t fully convince me. It’s more a kind of experiment with vocals, which is not entirely matching with the main content of the opus. Conclusion: Martyria brings different influences together although it mainly remains a mysterious ritual experience. It’s an intriguing and sometimes anguishing voyage through unknown territories transposed into music. Best songs: “Logos”, “Nyx”, “Pneuma”. … we have a small favour to ask. More people are reading Side-Line Magazine than ever but advertising revenues across the media are falling fast. And unlike many news organisations, we haven’t put up a paywall – we want to keep our journalism as open as we can. So you can see why we need to ask for your help. Side-Line’s independent journalism takes a lot of time, money and hard work to produce. But we do it because we want to push the artists we like and who are equally fighting to survive. If everyone who reads our reporting, who likes it, helps fund it, our future would be much more secure. For as little as 2 US$, you can support Side-Line Magazine – and it only takes a minute. Thank you. The donations are safely powered by Paypal. FREE Download – 92 Tracks ! Email this post to a friend. Your daily dosis of electronic music news, sometimes in a cheeky way. © 2016. Side-Line Magazine, the truth is out there.